Besides flying, being around airplanes, and airplane watching and identification, nothing gives aviation enthusiasts greater pleasure than reading about airplanes and aviation history. Aviation enthusiasts are engaged historians of flight and the technology that has made flight possible. In many ways, the history of aviation is as intellectual as it is visual. From the beginning of flight, aviation history reveals a great deal about man’s aspirations and courage. The history of aviation is warmly embraced by people who are dazzled by the romance of flight. Aviation enthusiasts are not armchair onlookers, rather individuals who possess abundant curiosity and excitement for man’s conquest of his environs. Aviation history is a visible reminder of man’s vision and ingenuity in conquering space. The Boeing 787: Dreamliner is a magnificent contribution to the history of civil aviation, albeit by focusing on the Boeing 787 Dreamliner. The authors of this instructive and handsome book, Claude G. Luisada and Steven D. Kimmell, have produced a skillful 152-page volume that covers the specs of this latest Boeing aircraft in admirable detail. The Boeing 787: Dreamliner chronicles the creation of this newest Boeing wide-body jet from the drawing board – in this case, the computer – given that this is the first Boeing aircraft to be completely designed by computer, to the airplane’s inception in the competitive commercial aviation market. The Boeing 787 was conceived in 1997, with a Boeing company study called Project 20XX. Boeing’s intention was that the Boeing 787 would replace the 757 and 767. The company was concerned that airlines were becoming more interested in purchasing airplanes that had longer range than they were in a greater number of seats. Because airplanes can take upwards of a decade to conceive, design and built, Boeing was mindful to incorporate state of the art electronics, avionics and the use of composite materials in the 787. Books dedicated to a particular airliner must offer abundant information about the airplane that it explores. In addition, readers of such books enjoy a pictorial history of airliners in diverse settings and the vibrancy of a variety of livery colors and designs. Readers want to know how the airplane was built and what makes it different, and perhaps better from other airplanes. These details are more important to aviation enthusiasts than they are to the casual passenger, who once settled into their seat immediately tune out, either by going to sleep or through electronics-induced myopia. The Boeing 787: Dreamliner contains many colorful photos and intricate diagrams of the 787’s computers and other components. 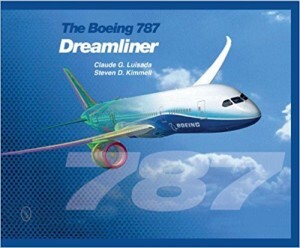 The book offers interesting comparisons between the 787 and other Boeing and Airbus airliners. Also, the dazzling array of interiors that the 787 offers prospective buyers is a telling example of the technology available today and how companies like Boeing are adept at trying to satisfy the demands of airlines and their passengers. Beginning with a concise and informative history of Boeing, the authors effectively convey the great work and complexity that building a wide-body jet entails. For aviation enthusiasts, an airplane like the Boeing 787 demonstrates the possibilities that human aspirations, long-term vision and industry can accomplish, for a technological marvel like the Boeing 787 is nothing short than the grown up imagination of science fiction from many decades ago.